Local Mum Esme Camilleri had applied to the Council for a one-off closure following the pilot of 'Playing Out', run by Local Mums Online and Sutton Council in September. 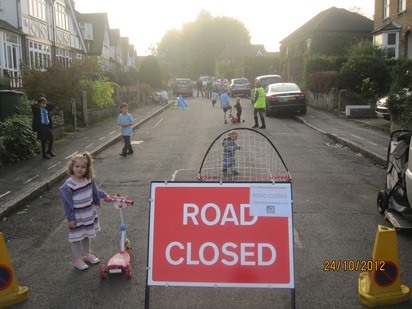 The idea of temporarily closing the road to traffic came about when two Bristol mothers, keen to give their children a taste of the simple freedom they themselves had enjoyed growing up, decided to ask their council for a one-off closure. Sutton Council followed suit and piloted the idea last month with the help of Local Mums Online. "As soon as I heard it might be possible to close my street to traffic to let my children play I couldn't wait to apply," says Carshalton Mum Esme, who has four children aged three to ten. "It's so lovely to see them playing freely outside our house without having to worry about cars." "It was so easy to organise," explains Esme, who applied to close Westcroft Road in Carshalton last month. "The Council made it so straightforward and all the neighbours thought it was a great idea. I had no objections whatsoever." At four O'clock, when she got home from school, Esme put up the Road Closed signs and told her delighted kids they were free to take their bikes, scooters, skipping ropes and chalk and hit the street. Her children were joined by scores of other children from the houses nearby and the road was soon filled with the sound of happy children playing. "What I love about this event is how well the children all play together," said Esme. "They are all different ages and many don't know each other but they quickly form a group and get on." "My children love Playing Out," agreed local childminder Caroline Brown. "They still talk about the day we closed our road to play outside and they were really excited to come here and do it again today." "It's a lovely, healthy thing to do for the children," agreed Esme's neighbour Gema Cavia, Local Mum of two boys aged seven and five. "It's so much nicer to see them playing happily outside their houses than stuck inside them playing computer games." Local grandmother Silvia Reader commented "We always used to play outside when we were younger. It's a wonderful idea to close the streets like this, I hope it can be a regular event in this area." "Now we have successfully organised three Playing Out events and everyone has reacted positively we are confident they will become a regular occurrence in Sutton," commented Kathy McGuinness, founder of Local Mums Online.